By Spearmint - Concertina by St. Simon. Plucky Liege was one of the most important broodmares of the 20th Century. 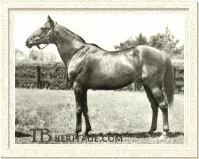 Two of her sons, *Sir Gallahad III and *Bull Dog were leading sires in America, and two others, Bois Roussel and Admiral Drake were sires of classic winners in England, Ireland, and France. Few mares have sired as many important sire sons and, as a result, wielded such far-ranging influence as this great producer. Concertina Bred in England by Lord Michelham, Plucky Liege was a daughter of the Derby and Grand Prix de Paris winner Spearmint. She was the twelfth foal out of the fertile but unspectacular broodmare Concertina, a daughter of the mighty St. Simon. She began her racing career without a name, starting in her first race as "the Concertina filly." She was eventually named "Lucky Liege," which became further modified into "Plucky Liege" to honor the town of Liege in France, whose citizens put up a courageous defense during the First World War. So named, the Spearmint filly made six starts at two, all at five furlongs, winning four of these. Although she wasn't a major winner, she impressed enough to earn an assignment of 117 pounds on the Free Handicap, third among fillies, and rated one pound behind Lady Josephine (another filly with a future). Unfortunately, Plucky Liege disappointed greatly at three. Her best effort in seven starts was a third going five furlongs, beaten by the top sprinter Friar Marcus in the Queensbury Handicap. She was also unplaced in the 1000 Guineas of that year won by Vaucluse. Having thus proven herself speedy, precocious, yet unable to improve off her juvenile form, she showed none of her sire's later maturing, staying influence. Perhaps this is why she was sold to Lord Michelham's secretary, Jefferson Davis Cohn, and took up her next career in France as a broodmare. Cohn had leased Haras du Bois Roussel and installed *Teddy as his home stallion, a horse he had purchased from breeder Edmond Blanc. There, Plucky Liege produced 12 foals in all, 11 of which were winners, and six of which won stakes, including two classic winners. Her first foal was *Marguerite de Valois, a 1919 filly by *Teddy, which won four races in France. She was imported to America carrying the colt Cleves (1931 by Sardanapale), who was stakes-placed, but it was her last foal, Hostility, a 1936 daughter of Man o' War that continued the family tradition. Hostility won the Acorn Stakes and placed in several others including the C.C.A. Oaks, Gazelle, and Alabama Stakes. Hostility produced the stakes winner Antagonism and the winner Boldness. Boldness produced the stakes winners Correlation and Big Raff as well as the broodmare Cequillo, and it's through Cequillo that come a flood of good runners, mainly bred by Tartan Stable including Fappiano, Ogygian, Dr. Patches, Quiet American and others. Another daughter, *Mademoiselle de Valois became the third dam of champion Roman Brother. 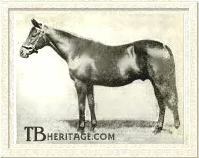 Plucky Liege's second foal was her first stakes winner, the 1920 colt by *Teddy named *Sir Gallahad III. *Sir Gallahad III's racing career was overshadowed by one of the best colts of the era, *Epinard, but he accorded himself well nonetheless. A winner of three races in five starts at two the Prix Eclipse, Prix du Petit Couvert and Prix de la Mediterranee. At three, he won four races, the Poule d'Essai de Poulains (French 2000 Guineas), Prix Daphnis, Prix Edgard de la Charme and Prix Jacques le Marois; he also placed second in the Prix Royal Oak and third in the Prix du Jockey Club. At four, he won the Lincolnshire Handicap in England, the Prix Boiard, Prix Daphins, and Prix Edgard de la Charme and ended the season by defeating the great *Epinard in a match over six and a half furlongs. *Sir Gallahad III stood two seasons in France before being purchased by an American syndicate headed by A.B. Hancock for $125,000 and relocated to Claiborne Farm in Kentucky. His first American crop included Triple Crown winner Gallant Fox. He became the American Leading Sire in 1930, 1933, 1934, and 1940, and was that country's Leading Broodmare Sire twelve times as well. Oddly, his influence in America was for classic staying ability, while he himself was at his best over shorter distances. 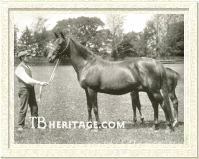 Plucky Liege's third foal was another *Teddy filly named Noor Jahan, foaled in 1921. A winner of three races in France, she was the dam of winners, and her most important offspring was the filly Avella (by *Epinard), from which descend Oaks winner Pia and Prix du Jockey Club winner Sanctus. Bois Roussel Plucky Liege's fourth foal was the colt Chivalry, a 1922 colt by Good Luck. He won two races at three in France but did nothing more. Her fifth foal was the equally uninspiring *Teddy filly Noble Lady (1924), a winner of two races which left no mark as a broodmare. 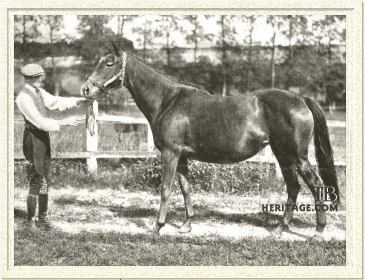 Plucky Liege's fifth foal was the filly Elsa de Brabant (1926), also by *Teddy, winner of one race at two and again, leaving no mark as a broodmare. In 1927, Plucky Liege again presented her breeder with a colt by *Teddy, and the combination was once again magic. Although not as good a runner as his older brother *Sir Gallahad III, *Bull Dog won the Prix Daphnis and Prix La Fleche d'Or, both at a mile as a three-year-old. By this time, his brother's first American crop was running, represented by Gallant Fox, Escutcheon, Pansy Walker, Flying Gal, and The Scout, all stakes winners. Charles B. Shaffer purchased *Bull Dog for $80,000 and stood him at his Coldstream Stud, Lexington, Kentucky. *Bull Dog was also an immediate success in America and led the sires' list in 1943, specializing in precocious, speedy two-year-olds like Plucky Liege herself. He was also the Leading Broodmare Sire in 1953, 1954, 1956, and 1958. 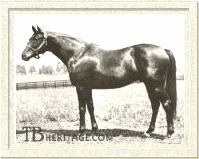 His son, Bull Lea, became the Leading Sire five times for Calumet Farm. In 1928, Plucky Liege produced yet another colt by *Teddy, and this one, named *Quatre Bras II, was also a stakes winner, winning the Prix Yacowlef in France. Brought to the United States, he was stakes-placed at five, and won two stakes, the Fort Worth and St. Patrick's Day Handicaps, at six. He was also placed in stakes at seven and retired to stud in Virginia, where he sired nine stakes winners, although nothing of great class. He was the last of the *Teddy - Plucky Liege siblings. In 1931, the 18-year-old *Teddy was sold to America and died there in 1936. Cohn switched Plucky Liege to *Teddy's good son *Aethelstan II and she produced the winning filly *Diane de Poitiers in 1929. Brought to America,*Diane de Poitiers produced several winners, but no stakes horses and none of her daughters bred on to any extent. Plucky Liege produced the Craig An Eran colt Admiral Drake in 1931, and he won five races including the Grand Prix de Paris at three, placing second in the French 2000 Guineas and third in the French Derby. He also won the Grand International d'Ostende at four. At stud in France, Admiral Drake was a consistently successful sire. His best was Derby winner Phil Drake, as well as French 2000 Guineas winner Mistral, besides Monsieur l'Amiral, and Amour Drake. His daughter *Source Sucree produced the champion *Turn-to, and another daughter Toute Belle II was the dam of Hard Ridden. . 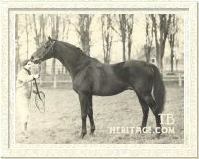 In 1933, Plucky Liege foaled a second colt by *Aethelstan II, this one named *Bel Aethel. He won three races in England and France including the Prix Daru, placing second in the Prix Edgard de la Charme and third in the Gold Vase. Sent to America to stud, he left only 76 foals before his death at the age of 10. Of those, five won stakes (an impressive seven percent), led by Bel Reigh, Plucky Flag, and Lights Abeam. About this time, Jefferson Davis Cohn was getting out of the horse business. He sold all of his stock including Plucky Liege, the stallion Vatout, and the lease on Haras du Bois Roussel, to Leon Volterra. For Volterra, Plucky Liege produced a brown colt by Vatout in 1935 when she was 23 years of age, a colt which was named Bois Roussel after the famous stud farm. In 1937, Plucky Liege's death was reported in the Bloodhorse Breeder's Review. In March of that year, she had produced a dead foal by Casterari and succumbed herself a week later at the age of 25. The following year, her last living foal, Bois Roussel, became the champion of his age in England, winning the Epsom Derby, Prix Juigne, and running third in the Grand Prix de Paris to Nearco and Canot. Retired to stud, Bois Roussel was another successful sire for his dam, getting Tehran (St. Leger), Ridge Wood, *Migoli (Arc de Triomphe), French Beige (Doncaster Cup), and Irish Derby winners Fraise du Bois II and Hindostan. Hindostan became a leading sire in Japan. Another son, Delville Wood became a leading sire in Australia. Tehran sired the Irish great *Tulyar. *Migoli sired Belmont Stakes winner *Gallant Man. Bois Roussel's daughters were also exceptional producers. He was a tremendous influence for classic stamina. The remarkable life of Plucky Liege came to an end in 1937, but the ripples of influence descending from her through her four top sire sons, *Sir Gallahad III, *Bull Dog, Admiral Drake, and Bois Roussel, not to mention the offspring of her daughters Marguerite de Valois and Noor Jahan, continued spreading outward for generations. English Derby winner Roberto carried three of the four brothers in his pedigree, and he was linebred 5x5x7x5 to Plucky Liege. Nearly every major runner in the world today carries at least one strain of Plucky Liege. A couple observations are worth noting about Plucky Liege. She was the twelfth and probably best foal of her dam, and she herself was not only an extremely fertile mare, producing 12 foals, but continued to produce at the highest level right up to the end of her life. She maintained the distinction of being the oldest 20th Century mare ever to produce an Epsom Derby winner, which she did when she was 23. Her sons and daughters were also generally long lived and prolific. Secondly, it's interesting that while two of her daughters, *Marguerite de Valois and Noor Jahan, became influential in the long run, neither was a great runner or considered a blue hen like their dam. On the other hand, Plucky Liege's top sons were far above the norm as runners and sires. The above photo of Plucky Liege shows her in the paddocks of Haras du Bois Roussel. She is a spare-looking, lengthy bay mare with sickle hocks, and her left hind ankle is white. The magic was obviously deep inside, where no one could see it but her owner, Jefferson Davis Cohn. ©1997 - 2005 Thoroughbred Heritage. All rights reserved.